Josh opened the door and then SLAMMED it in Matthew's face! Now that was not at ALL what Matthew was expecting. Josh could have at LEAST called him on the phone and told him not to come over. He would have just stayed home in the first place to avoid this kind of trouble. ...but got SLAMMED with another? "Go and wash in the Jordan River seven times," Elisha's servant told Naaman, "and your skin will be cleaned, and you will be healed of your leprosy." Everything was going so well for Naaman, the commander of the Syrian army, until the day that he discovered he was a leper and was going to DIE! The young girl who waited on Naaman's wife had told her about the Prophet Elisha, and Naaman had come ALL the way from Damascas to be healed from his leprosy. But now Elisha would not even come out of his house. "Look! Did you hear THAT?" 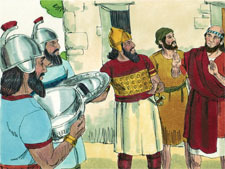 Naaman asked his servants. "I thought surely the least he would do would be to come out and talk face-to-face with me! I figured he would call on the name of the Lord his God, strike his hand over the leprosy on my body, and CURE me! "Aren't the rivers back in Damascus better than all these muddy rivers here in Israel? If it's rivers I need, why can't I just go home, wash in our OWN rivers, and be clean?" 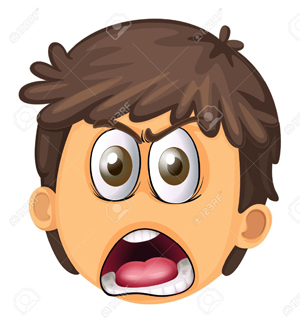 The Bible says, "He turned and went away in a RAGE." Well, Naaman's servants weren't going to just let him turn around and go back home after coming all THIS distance! They gathered around him and respectfully pleaded with him: "If the prophet had told you to do some great thing, wouldn't you have done it? How much more then should you listen to his words and simply go wash and be cured?" 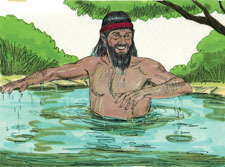 So Naaman went down to the muddy Jordan River and began to dip himself into the water, as the prophet had told him to do. "Don't stop now!" his servants called to him. "Still no change," he called to them on the shore. "The prophet said SEVEN times," they answered back. Muttering to himself, "See! This is NOT going to work. 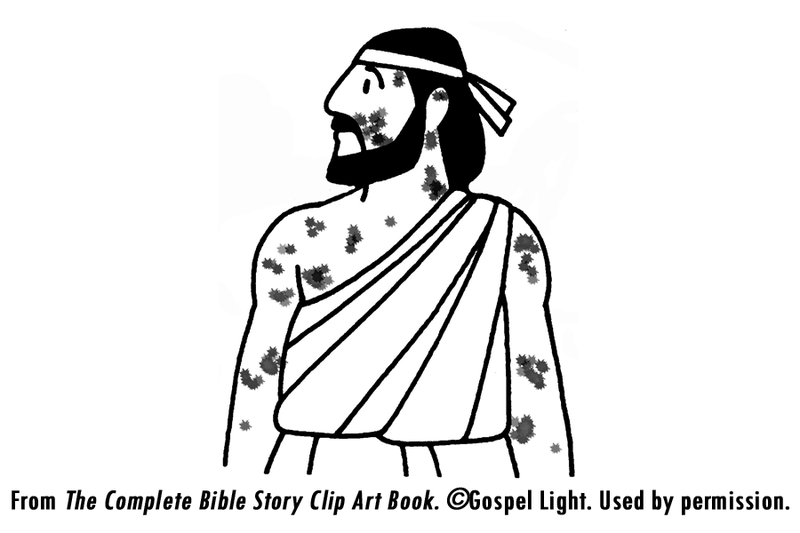 Not even one spot of leprosy has BEGUN to leave," Naaman dipped himself into the muddy Jordan River one last time. How exciting! He was instantly cured from the leprosy that had plagued him. He wouldn't die, after all! Naaman couldn't wait to show the Prophet Elisha, so he and all who were traveling with him returned to the prophet's house. ...ONLY God in ALL the earth! "Now please accept these gifts from me," he told the Prophet Elisha. But Elisha replied, "As the Lord liveth, before whom I stand, I will receive none of them." Naaman urged him again to take them, but he flatly refused. "Well," Naaman said, "all right. From now on I will never again offer any burnt offerings or sacrifices to any other gods except the Lord." "Go in peace," Elisha said. So Naaman climbed up in his chariot and began the journey home. Gehazi, Elisha's servant, watched the departing chariot and said to himself, "My master shouldn't have let this fellow get away without taking the presents he brought." He decided right then and there to run after him and get something from him since he offered it anyway. So Gehazi caught up with him. 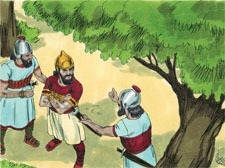 When Naaman saw him running after him, he climbed out of his chariot to meet him. "Yes. Everything's fine," he said. "My master has sent me to tell you that two young prophets just arrived at our house. He wants to know if you could please give them some silver and two changes of clothing." "Here. Take this silver and a little more," Naaman insisted. He reached into the chariot for two bags, put the money in them, and tied them up. Then he took two expensive robes out of the chariot, and had two of his own servants carry all the gifts back to the house for Gehazi because it was too much for him to carry by himself. When Gehazi came to the hill, he took the things from the servants and put them away in the house. Then he let the men go, and they left. Afterwards, he went in and stood before his master. Elisha asked, "Where have you been, Gehazi?" "I haven't been ANYWHERE," he answered. But Elisha knew better. "Don't you realize that I was there in spirit when Naaman stepped down from his chariot to meet you? Is this the time to take money, or to accept clothes, and olive farms and vineyards, and sheep and oxen, and servants? 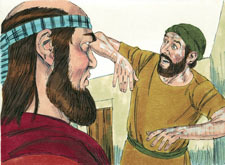 Because you have done this, Naaman's leprosy will cling to you and your children, and your children's children FOREVER." And Gehazi walked out of that room, his skin white as snow with leprosy. How did Naaman expect Elisha to heal him? Do you think Naaman would have been healed if he had ducked seven times in the river back home in Damascus instead? 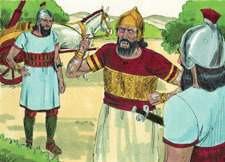 What did Gehazi do when he heard Elisha refuse Naaman's gifts? Sin is much worse than leprosy and only the Blood of Jesus can wash us clean from our sin. old things are passed away: behold all things are become new"
from the ugly spots of sin.